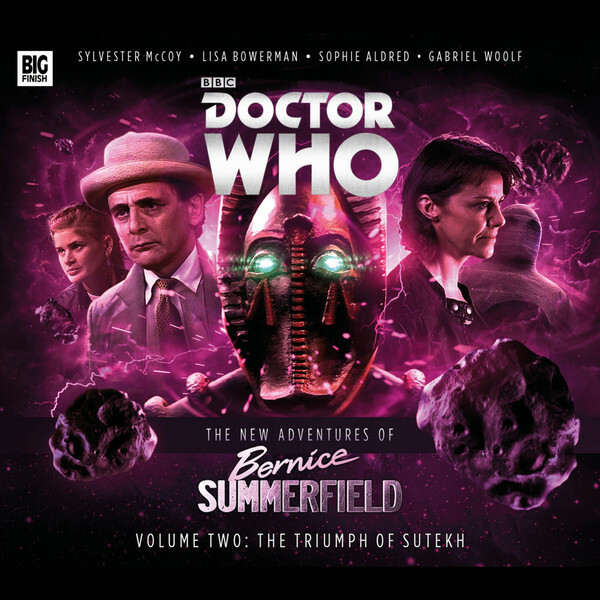 Big Finish - The New Adventures of Bernice Summerfield, Box 2: The Triumph of Sutekh - Review | Warped Factor - Words in the Key of Geek. Tony Fyler walks like an Egyptian. Do you fancy actually laughing out loud today, rather than just ‘lol’ing? How about a bit of a time-twisting adventure with the Seventh Doctor, Ace and Bernice Surprise Summerfield, taking in ancient Egypt, modern Egypt, a pyramid on Mars, modern…and why not?…Switzerland, a loopy Doomsday Cult, the far future and…erm…Doomsday? 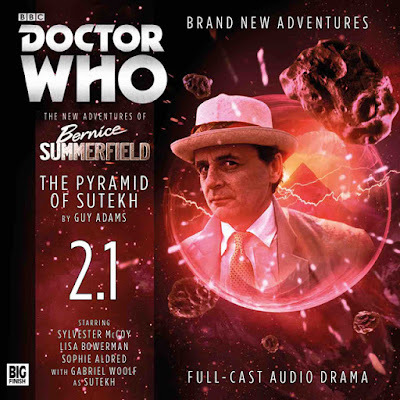 Now here’s the kicker – how about four lavish hours of listening to Gabriel Woolf reprise the character of Sutekh, right there in your ears. Just in case you’re not getting the subtle subtext of this opening, GET THIS DAMNED BOX SET! I often wonder whether people read reviews in this modern day and age, and if they do, whether they get past the capsule bit at the start. Hopefully, you will, but if you don’t, that should give you enough of a visual clue as to what you should do now. You should, fairly obviously, go and get this box set. If you do, you’ll have better things to do that read the rest of this review, and I promise, if you do, I’ll stop telling you to go and get this box set. If you’re still here, and you have the impertinence to want to know more, then here’s what you need to know. Sutekh, as in ‘The Triumph of…’ is the villain of the Pyramids of Mars. We’re going to get nowhere if you haven’t seen Pyramids of Mars. Go and do that, and come back to me. Even if you know it inside out, it’s not like you need much of an excuse to go and watch it again, is it? It was one of the very best of Tom Baker’s stories: Sarah-Jane, an Edwardian setting, heaping helpings of Egyptology, killer robot mummies, and Sutekh, an Egyptian god who was actually an alien, but pretty much still a god, voiced by the natural wonder that is Gabriel Woolf. It’s top-notch 70s Who from mostly Robert Holmes, and it’s never been reprised on screen since because a) you run the risk of tarnishing a pretty flawless original, b) Sutekh is bound for most of Pyramids of Mars, and once you let him out, he’s pretty much unbeatable. I know this because, in my own egotistical way, I recently tried to write a synopsis for a two-part ‘return of Sutekh’ story for an ongoing series of ‘as-yet-unrebooted-Classic-villain’ articles (coming soon!). I did that before plugging the second New Adventures of Benny series into my ears, and I’m delighted, not to say a bit smug, to hear that Big Finish and I came up with at least a couple of similar ideas. 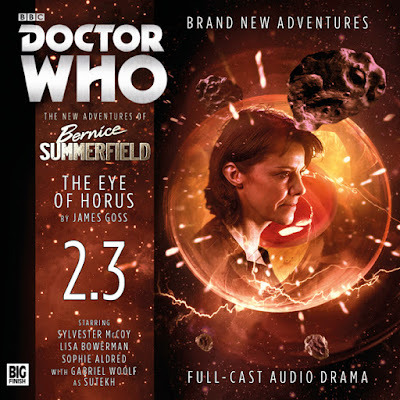 This four episode story-arc though has a great, grand sweep, additional Osirans to the one you’re familiar with, and, best of all, it has Lisa Bowerman on ridiculously good form (despite apparently suffering terribly and being pretty much voiceless during some of the recording) as Bernice Summerfield. When you have a character like Benny, the real challenge is writing to make the most of her many strengths, without tipping it over into glib sarcasm at all the things the universe throws at her. As benny actually says in this box set, she’s ‘terribly good fun in a crisis,’ and balancing that with the drama of the crises the universe throws at her is key to making her as enjoyable as she can be, rather than just a smug, smartypants know-it-all. 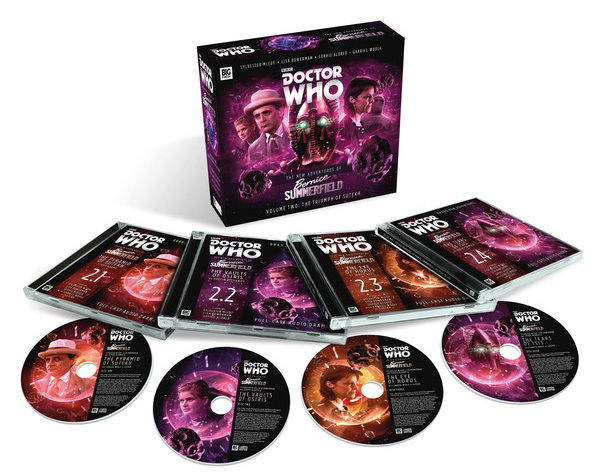 That was a balancing act that was pulled off in spectacular fashion with the first New Adventures box set (reviewed here) when she faced Daleks, consequences, her own grief and more besides. In The Triumph of Sutekh, she moves on from metal gits with a racial purity complex to your actual Egyptian gods with a…well, a god complex, obviously, and it’s a mark of the dedication of Bowerman and Big Finish that she comes through this set feeling never less than wholly Benny, while at the same time reacting to the different challenges with appropriate drama, stress and what-the-hell-next universe-fury. Oh, good – a robot killer mummy who’s read Alice In Wonderland. Because in another nod to the continuity of the original Pyramids, the guardians of truth and lies are back, used in a spectacularly engaging way, giving Benny plenty of psychological trouble to deal with. Also, dying doesn’t help. The Vaults of Isis by Justin Richards follows on the heels of The Pyramid of Sutekh, deals with some of the same issues, but also brings in the effects of the Arab Spring, a bit of grave-robbing, bank-robbing and museum-robbing fun, and ooh, look! Acolytes! Nazis! A big giant ball rolling down a corridor! (Am I joking? Find out – get this box set!). A Swiss bank, and the answer to the question ‘If you were an immortal Egyptian god or goddess, where would you hide out?’ All that’s really missing is a 73-year-old with a hat, a whip and a fear of snakes. It’s a knockabout romp, with Benny and Ace working well together in the absence of the short Scottish bloke with the umbrella, and with more mummies than you might expect in a Swiss bank vault. The Eye of Horus, by James Goss. Hmm. Bit of a slog, to be fair, this episode, mostly because in a Benny box set it feels like a tonal struggle to have an episode that mostly deals with internal royal politics in ancient Egypt – albeit an ancient Egypt trading with the stars on their flying barges, thanks to the interference of a strange little advisor with a hat and way of rrrrrrrrrrolling his rrrrrrrrs. There’s a great deal of Sutekh the seductive here though, as the lord of the flies interferes with the plans of royalty to get himself an obelisk built that can bring about the age of darkness and death, so it’s very yin-yang storytelling territory – if you like your Seventh Doctor mysterious and aloof and busy with games of his own, and your enemy powerful and whispering in your ear like a Devil trying to make your dreams come true (and if you do, there’s officially no-one better to get for the job than Gabriel Woolf, which is presumably why he made a resurgence in New Who as The Beast), then this one has plenty to offer, and it does have that Virgin New Adventures feel of plot-layering and time-taking about it. It’s just a little Benny-light for fans of Bowerman’s archaeologist in her spunky, line-spitting form. There’s plenty of that Benny to be had in The Tears of Isis though. Imagine Benny pitted against a cult of Sutekh-worshippers and you’re in the right territory. Great lines from Una McCormack abound, including one about what the legendary God of Death is likely to get up to once he arrives, and the unlikelihood of there being much in the way of dancing. There’s an oddly authentic, Ghost Light feel about the situation we’re presented with – creepy people and innocent people trapped in a country house with (apparently) a really lovely croquet lawn, while the world ends outside their gates, and they await the arrival of a staggeringly powerful being from beyond the stars. It’s got a bit of a Ghost Light finish to it too, the Doctor handing over control of the situation to another entity entirely and trusting them to sort it out for him. But certainly as a final episode to the second box set, it’s up there in the Benny stakes, gives Ace a good bit to do, and allows the Doctor to do that particularly Seventh Doctor thing of swanning in at the end, looking smug, swinging his umbrella, while his companions either want to hug him or beat him severely around the head and neck. Possibly both, in Benny’s case. Overall, Big Finish have pulled off a very delicate balancing act, delivering a Sutekh arc that feels epic and only in one episode feels unnecessarily hobbled to provide a story. What’s almost as impressive is that the company has built on the first New Adventures Benny Box Set with a story far greater in scope if slightly less rich in tender, emotional moments, that allows Benny and Bowerman both to shine, and to bring in both new fans and old. The upshot of which is obvious: really, seriously, get this box set!